Episode 1-2: Bosco, Bernice, Kevin, Wayne appears. Enter the School of Sacred Swords. Episode 4-5: The green creature appears. The disciples undergo training. Episode 6-7: Disicples’s day out. The Blood Shadow clan’s arises. Shirley appears. Episode 8: Competing to be selected. Sharon’s past revealed. Episode 9-10: Shirley saves Kevin. Kevin tries to rescue his mother. Episode 11: Kevin’s mother’s story revealed! The Blood Shadow Clan’s attack! Episode 12-13: Good bye Kevin! Wayne gets poisoned. Episode 14: Bosco’s true identity revealed! Accepting his past.. Episode 15: Sharon saves Kevin. Bosco acts strangely. Bernice’s father finds out the truth! Episode 16: Bosco spends time with Sharon. Episode 17: Bosco sees Bernice’s father’s true nature. Wayne’s death. Episode 18: Enter Sky One Tribe. Shirley sleeps with Bosco. Episode 19: Bernice, the new leader! Episode 20- Final: Sharon’s death. The final battle. Overview : Thoughts on the overall series. Review-like. Here are the PinYin for Devil’s Disciple Themesong! I agree with DP say, the entire series is good but in the end is so wrong. I though bosco and bernice is the one will be together at the end. I was dissappoint when i see sherley and bosco together. I was not happy at that part. By the way, even bernice not with bosco in the end of the movie. her heart always belong to him and he know that to. 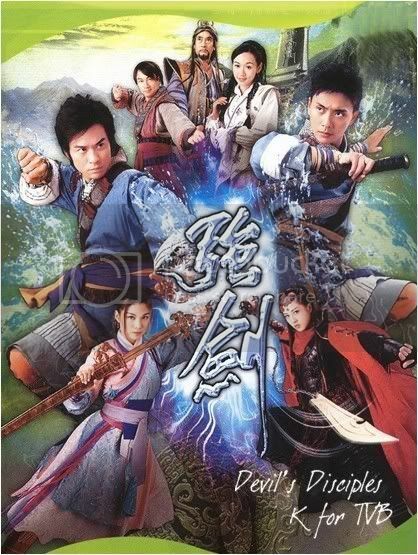 I hope TVB will made a second one of devil disciples. the reason i say this, in the end i still see that there no peace yet. Nice starting of the Devil’s Disciples but I was dissappointed with the ending of the story. I’m Bernice with Bosco. the entire movie was great! this is one of my favourites…except for the end. its so wrong.its not a happy ending.Sharon died in the end.i think they should make movies like this. I HATED how sharon had to die in the end, seriously, i was hoping shirley would have taken the damage, and bernice x bosco would come true. Its sad, but hey, the ending would be better..what was UP with the ending and the song?! that just..ruined it! I’d also like 清心普善咒 if it’s available. Much appreciated.